Heard the news? Seen the memes? The JPM Coin is pretty much what everyone has been talking about since news of its birth came along on Valentine’s day last week. 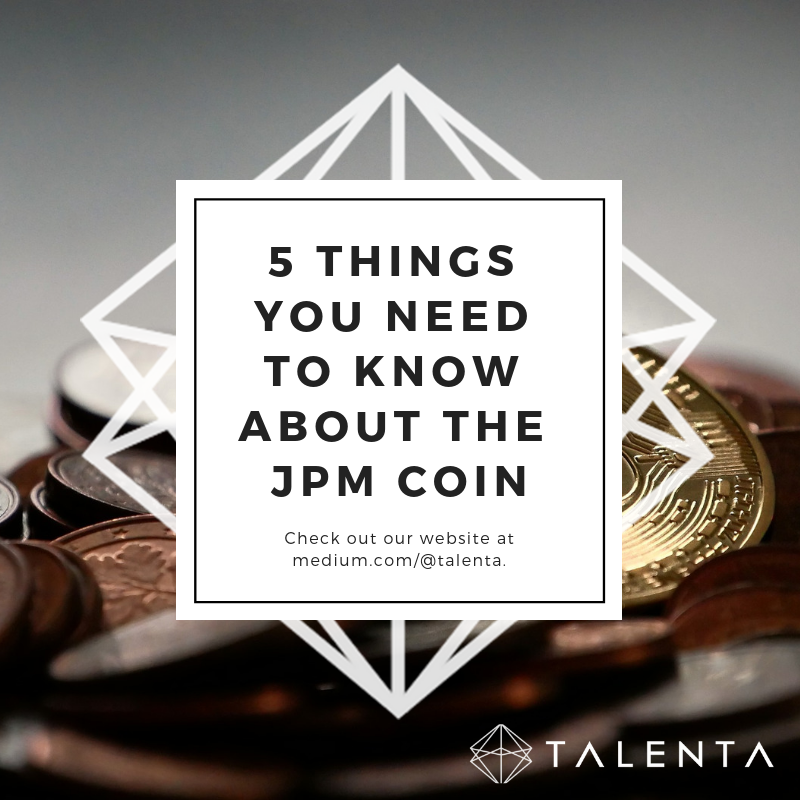 If you’ve been suffering from FOMO all week amongst your crypto-enthusiast colleagues, fear no more — here’s a quick read to get you up to date with all you need to know about the JPM Coin. 1. What’s All That Hoo-Ha All About?? Alright, let’s get that huge question mark out of the room. Amidst the influx of corporate AND national involvements in cryptocurrencies and stablecoins this year, news of yet another corporate coin shouldn’t have been that big of a deal. Only this time, the coin belongs to JPMorgan, whose CEO Jamie Dimon has been notorious for his critical comments bordering the offensive, specifically about Bitcoin (see below). Well, things will be taking a huge U-turn for this guy because the JPM Coin is here to stay. His company appears set on leveraging on the JPM Coin to prepare for a future where blockchain technology is a key part of its financial infrastructure, even citing future plans of it being “subsequently extended to other platforms” and that “JPM Coin will be operable on all standard Blockchain networks” despite its humble start as a resident on the private Quorum Blockchain. 2. What Exactly is the JPM Coin? At its core, the JPM Coin works as a stablecoin — meaning it is asset-backed, and in this case, by JPMorgan’s whopping USD 2.6 trillion with a 1:1 ratio. That’s right, you won’t be seeing much volatility from this guy; a pretty good choice given the blistering cold in today’s cryptocurrency climate. Also something else you won’t be seeing — at least not as an individual consumer — is the JPM Coin’s listing on exchanges. The company has made it clear that the coin is currently “a prototype that will be tested with a small number of JPMorgan’s institutional clients” and is “designed for business-to-business money movement flows”. In short, unless you’re an institutional customer complying with anti-money-laundering and know-your-customer rules, the closest you and I will get to experiencing the benefits of this coin would likely be cost-savings and efficiency this initiative brings with at a consumer level. The process isn’t really as complicated as you think — all anyone needs to know about the workings of this coin are fully encompassed in three simple steps (see diagram above). To perform transactions, JPMorgan’s institutional clients first get their fiat dollars issued for a commensurate amount of JPM Coins. These will then be used over the Ethereum-based Quorum Blockchain to transact swiftly with other JPMorgan clients. Once the transaction has been completed, the recipient can proceed to redeem their fiat dollars with the JPM Coins. Simple as that. The entire process is expected to take seconds to minutes to complete, a huge step ahead from the days and weeks JPMorgan’s currency legacy system takes to perform wire and asset transfers. It really is a great time to feel alive. The JPM Coin came in at a time when fellow competitor Ripple is on a roll; the American blockchain-based remittance network has been forging partnerships left and right with major banking institutions in recent months and hasn’t been showing any signs of stopping. Its other competitor, Stellar, also has a few stablecoins issued on its blockchain for the exact same purpose of money transfers. The strongest trait that sets the JPM Coin system apart from its two primary contenders is the fact that the JPM Coin is owned by a single bank, JPMorgan, while both Ripple and Stellar are both independent platforms created to serve multiple financial institutions as an intermediate, neutral third-party. While all three will be fishing from the same market, JPMorgan already has an edge above the rest with its current hold on the USD 6 trillion money movement around the world every single day. 5. How Does it Affect Bitcoin? Honestly, it doesn’t. The JPM Coin is a stablecoin used exclusively on the private Quorum blockchain for utility purposes — at least for now — hence, will not be classified as anything remotely close to that of Bitcoin despite their common trait as cryptocurrencies. It will, possibly affect the valuation of Ripple though. With the JPM Coin targeting the same international market Ripple finds its core in, it is likely that the ranks will see some movement if Ripple doesn’t grip tight to its current market AND potential clientele before JPMorgan swoops in with its heavyweight label. Now, let the race begin. A professional management consulting company providing one-stop solution to blockchain projects and crowdfunding campaigns.